Weekly Happenings: We’ve mostly been ticking off our boxes for the final countdown before Abigail arrives. Paul finished up final exams and projects, I crossed the last thing off of my “must-do-before-baby” to-do list, and Joseph had an epic last week of school before the winter break (his teacher must be exhausted). When I say the “final countdown”, I really mean it. At my last OB appointment, we set up an induction date. If she doesn’t come independently, we’re going in early this next Thursday morning to put everything in motion. One of my friends has already graciously volunteered to watch Joseph, so we’ll drop him off at her house the night before. It’s baby week! 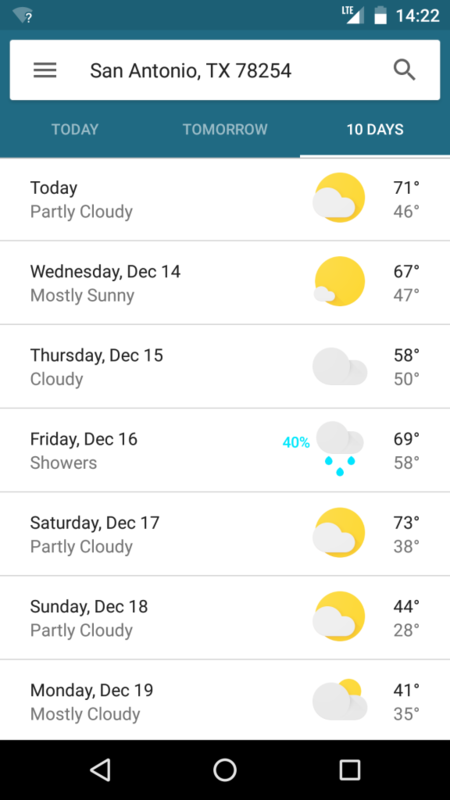 The Weekly Weather: It’s been crazy to say the least. We’ve had cold days, cool days, and down-right warm days all mixed together. I think the craziest temperature jump was yesterday. During the day, it was literally in the upper-70s. By last night, it was down in the 40s. Today’s high is only suppose to be 41, with an overnight low of 29. Yeesh. What Paul’s Been Up To: He’s mainly been finishing up with his classes. 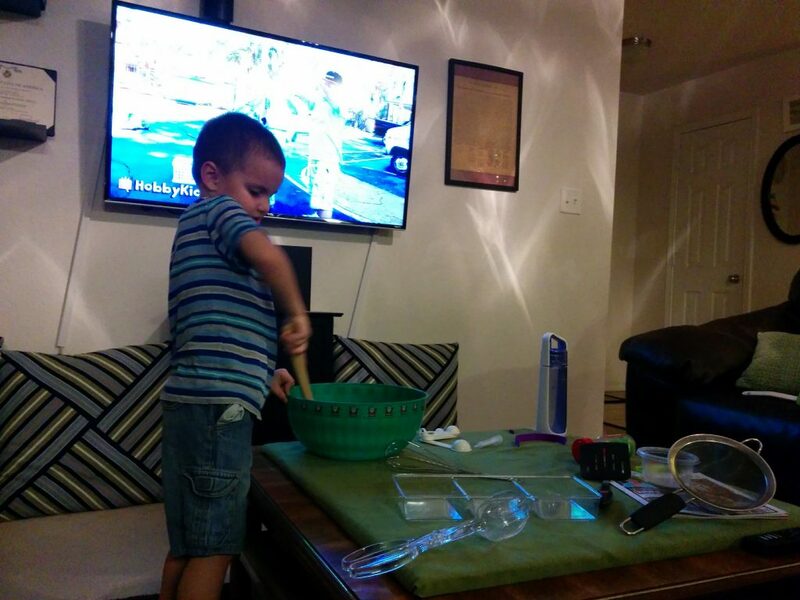 He’s also been a huge help with Joseph since I just haven’t been up to doing a whole lot. 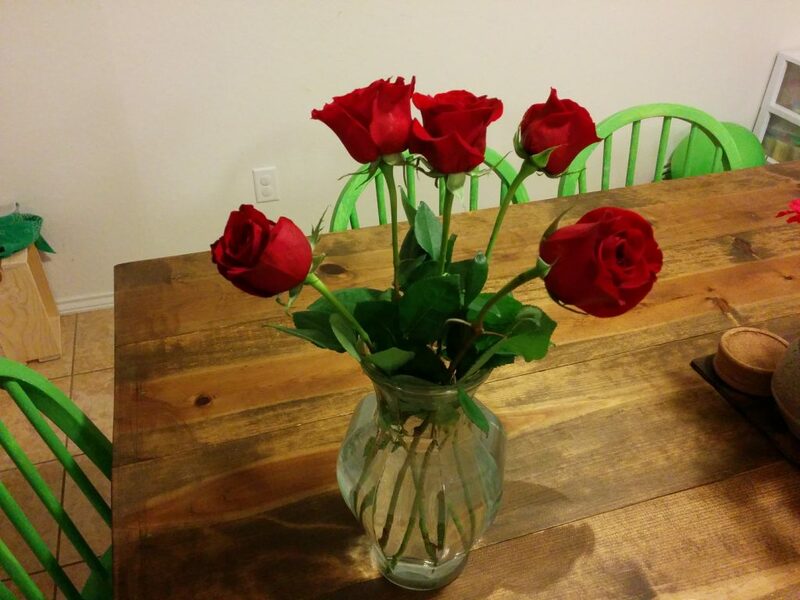 I sure did marry a great guy! One fun thing that happened was that his former coworkers (from when he was working in the DLI library as opposed to the IT department) surprised him with some gifts for Abigail. They made a diaper cake and also gave us some cute outfits for her. We were not expecting it in the least, and it was so sweet! It means so much that they would still think of us even though he’s no longer working in their department. What Sarah’s Been Up To: Mainly the normal stuff with a few extra things thrown in. I finished up with my piano students until March (making sure I get recovery time in there and also just getting used to the new way our house is going to run warrants for a bit of a break). I also helped out with Joseph’s class party on Friday. I was in charge of the cookie decorating center, so I helped small groups of his class decorate sugar cookies. It was fun, but exhausting, haha. I was ready for a nap afterward! I also went to my final ultrasound/growth scan for Abigail (she’s measuring at about 7.8 lbs) and my last OB appointment (I’m already 2 cm dilated). I have one more appointment for an NST (non-stress test) and the last meet up with the nutritionist to go over my blood sugar numbers (which have been great). I’m so amazed that I have been able to control this gestational diabetes with diet alone. Not every momma is so lucky. For many of them, even if they start out diet-controlled, their numbers start to rise towards the end and they end up needing medication or insulin injections. My numbers have actually been getting a bit lower as we’ve gotten towards the end. It’s amazing to see the Lord’s hands in truly all things. What Joseph’s Been Up To: He had a really great last week at school. I think he brought home a new craft every day (including a few fun ornaments for our tree). I feel blessed to have him in this pre-k program. It reminds me of what kindergarten was like when I was five. 🙂 It’s been a fun transition into school for him. The more I think of it, the more I’m grateful he didn’t have to go from absolutely no school exposure to a straight 7.5 hours of school. It most likely would have been really rough…on all of us. Joseph has also shown us just how patient and understanding he is. We’ve been getting a lot of stuff for Abigail this last little bit and he has not complained, once. 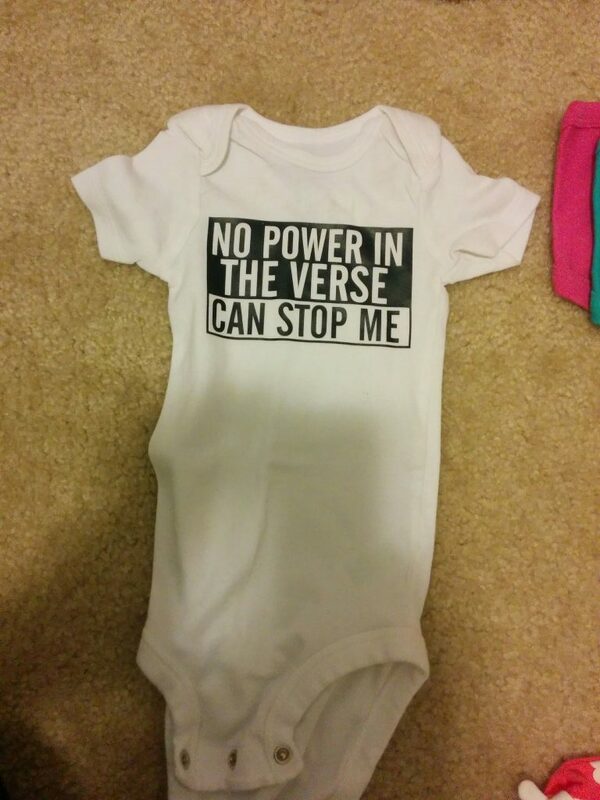 We have gotten him little things here and there (and a sweet sister in our ward included a gift for him when she gave me a gift for Abigail) to make sure he knows he’s not totally getting left out, but that hasn’t caused an increase in the “I wants” in the least. I think that Christmas being so close has helped a bit, since he has presents to look forward to. One of my favorite things about him is that after he receives something, he is immediately grateful. He’ll tell us thank you and express how nice it was of us to get him something. He does that with the other people that have given him things, as well. Last night, we had friends over for games and we had a bit of a gift exchange. Joseph was not forgotten in that two of our friends brought gifts for him. He was quick to tell them thank you and and then later told me that it was so nice of them to bring him gifts. He really is a gem of a kid. Mixing up imaginary pancakes for me “since you can’t have real ones because it would mess up your blood sugars.” Seriously…so observant! Just to show a bit of what we’ve been experiencing, weather-wise. The fluctuations have been just a bit crazy. 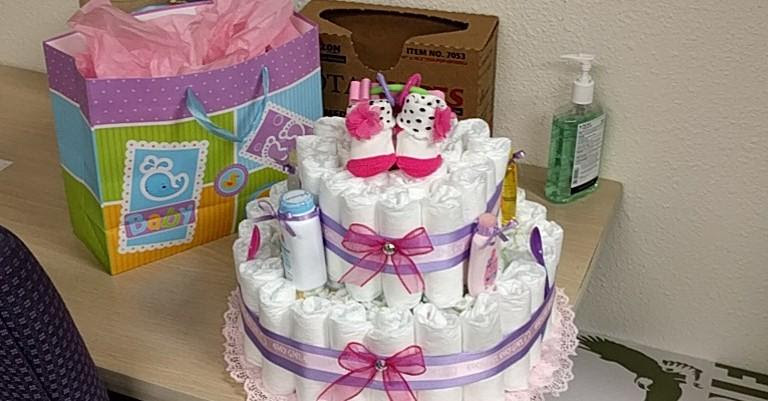 The diaper cake and present from the DLI library staff. I loved all the little useful things tucked into the cake. We needed to run out to the distribution center by the temple yesterday. While I took care of business in the center, Paul walked Joseph around the temple grounds. It’s always so peaceful there. 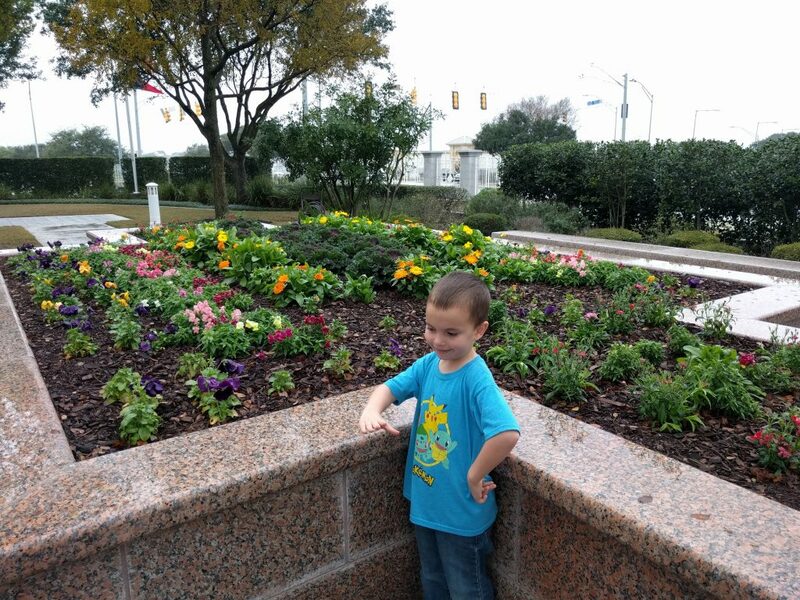 Here’s Joseph in front of some flowers (I love the landscaping). I love this picture. 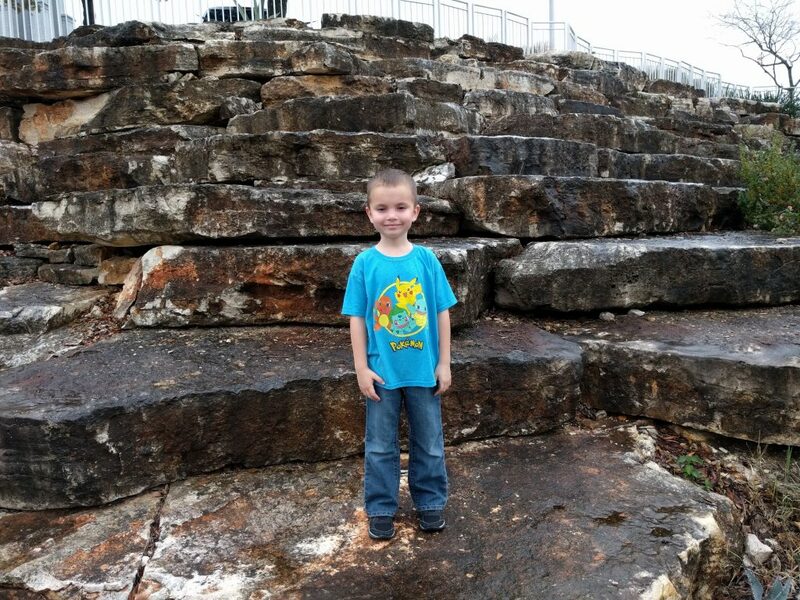 We didn’t see these rocks the last time I took him there. I’m glad my boys were able to go on an adventure! 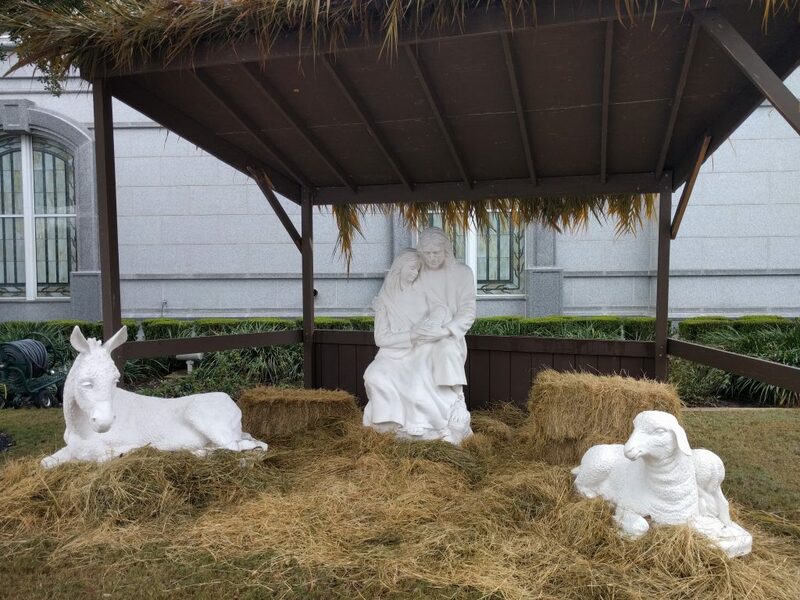 While the grounds aren’t decorated with lights like some other temple grounds, they do apparently have this really beautiful nativity display. 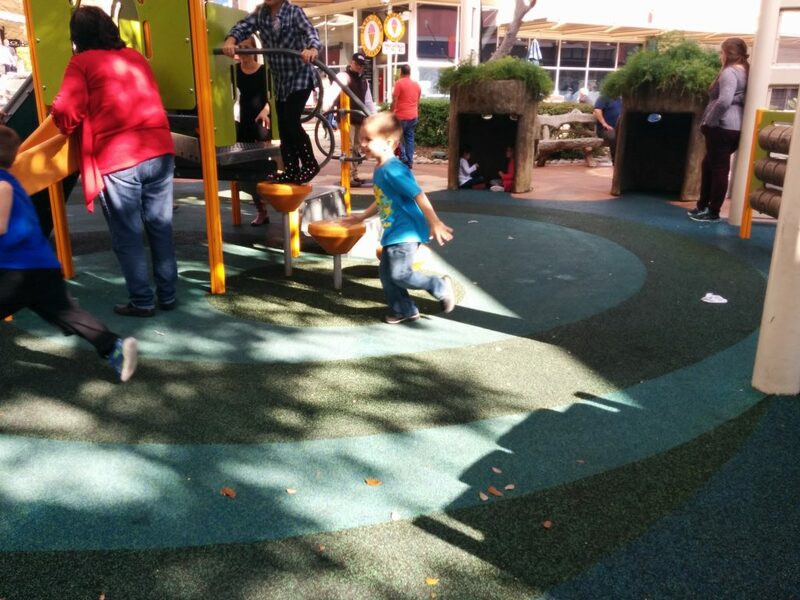 After finishing up at the temple, we had lunch and then took Joseph to the outdoor play area at La Cantera. Notice he’s not wearing a jacket? That’s because it’s almost 80 degrees in this picture. 5-6 hours later, it was in the 40s. All this next week is supposed to be cold, so it’s a good thing we squeezed in this play time! He was playing tag with some insta-friends (kids he’d just met a few minutes before).